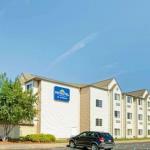 The Microtel Inn & Suites by Wyndham Roseville/Detroit Area offers our guests a complimentary breakfast cozy accommodations and location right off I-94. Renovated in 2010 the three-story Microtel offers 98 non-smoking rooms with coffeemakers cable TVs and comfy window seats. Accommodations with microwaves and refrigerators are available. Select from a range of healthy and hearty items at the free breakfast. Work up a sweat in the fitness room. Copy and fax services are available in the business center. Take advantage of the guest laundry when you're out of clean clothes. Pets are welcome. High-speed internet access is available. The Microtel is located off I-94 about 25 minutes from the attractions in downtown Detroit including Comerica Park Ford Field the Fox Theater and Detroit Institute of Arts. Motor City Casino is 18 miles. Metropolitan Beach on Lake St. Clair is seven miles. A few restaurants are within walking distance and many more options await one mile away at Macomb Mall. The hotel is 30 miles from Detroit Metropolitan Wayne County Airport.